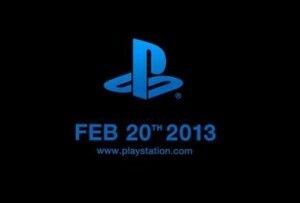 In what appears to be a much-anticipated date confirmation to pencil into the wait for the Sony PlayStation 4 games console, the Japanese company have launched a ‘teaser website’ that hints at the next in their console line possibly being revealed to the public as early as this month, a move seemingly confirmed by a ‘trailer’ that was also posted yesterday. The 45-second video, released on PlayStation’s official YouTube channel late last night with the title of ‘#PlayStation2013′, does not reveal too much information until the end, in which it announces the date that fans should be looking out for (pictured), and with an official tagline of ‘see the future’, indicating that the PS4 console could be uncovered as of 20 February, a week before the previously-hinted ‘Destination PlayStation’ event. Further details on the website claim that the ‘event’ being advertised will take place at 6pm ET. The console (codenamed ‘Orbis’), much like Microsoft’s expected rival that will also be shown to the public over the coming months, has seen its lengthy share of rumours, including new methods in user accounts and possible anti-copyright systems, a new controller design, and support for 4kHD, amongst others.